While the very controversial argument of who owns Scarborough Shoal is on-going between China and Philippines, well say Hurray for this newly approved Philippine territory, the BENHAM RISE, the newest paradise of the Philippines! United Nations has approved the territorial claim over this area rich in minerals, natural gas deposit and unique underwater species. Benham Rise, a dynamic region facing Luzon's eastern seaboard, is rising slowly to the surface of the Pacific Ocean. It is a foreseeable habitual place in no time. 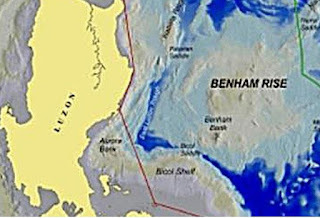 Benham Rise is larger in area than Luzon with the area of 13 million hectares under water and a hundred nautical miles or 85 kilometers away from Luzon. Just recently, using the latest technologies, Philippine Marine Scientist explored Benham Rise and fell in love with the beauty of the newest addition our territory. No remnants of illegal fishing yet and purely 120 % coral reefs covered. Most expensive Tuna exported in European Countries, America and Japan can be found here. It has been shown to have natural gas deposits and manganese nodules, vital in the production of steel as well. Well no doubt, sooner or later, this Benham Rise will be added to the Philippines list of most loved Travel destinations. Let’s all hope for the best that this place will remain as paradise as it is and everyone will be responsible steward.